Welcome to Glenmore. Situated in the heart of Beveridge close to schools and sports facilities, Glenmore is Beveridge’s latest land for sale release, located just 50 minutes from Melbourne’s CBD and minutes away from the amenities of Wallan and Craigieburn. 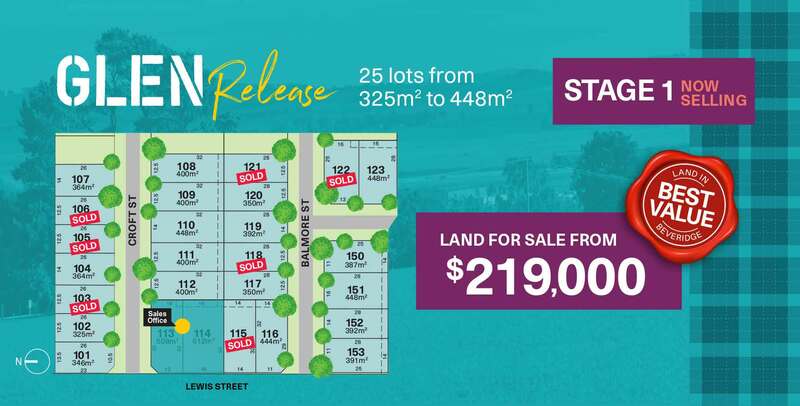 If you’re looking for a great value, large block of land in Beveridge, close to Mickleham, Donnybrook or Kalkallo, then Glenmore is the perfect place to find your dream block of land. Featuring a wide range of affordable, level lots with views, and House & Land packages from Melbourne’s best builders, you’re sure to find an option that suits you. The First Home Owner Grant has increased from $10,000 to $20,000 for newly built homes under $750,000 in regional Victoria. Contact our Glenmore team today to discover if you're eligible or visit the government website to learn more. ENQUIRE NOW DO WE QUALIFY? The Glen Release consists of 67 home sites to be released over 3 stages. With blocks ranging in size from 325m2to 540m2 there’s plenty to choose from. Stage 1 is now selling and consists of 25 lots, with sizes from 325m2 to 448m2. Come and chat to a sales consultant at our sales office, Lewis Street, Beveridge.